In an annunciator application, each time a remote button is pressed, an LED goes on for about 20 seconds. During this time interval, I was asked to activate a medium level sound buzzer for about 10 seconds — adjustable by a pot. 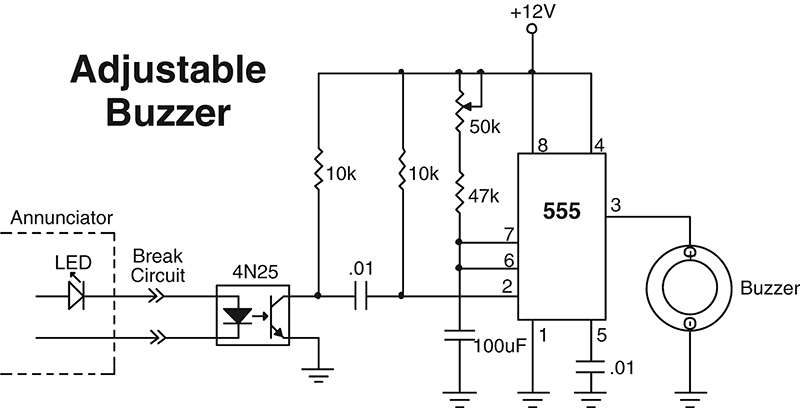 Can you please show a cheap and reliable circuit? The 10-second buzzer tone is easily accomplished using a 555 one-shot monostable multivibrator and an off-the-shelf 12-volt piezo device. The values given here support a range from 5 to 11 seconds. Increasing the value of the 47K resistor lengthens the time the buzzer sounds; decreasing the 47K resistor shortens the time. The tricky part is inserting the 4N25’s LED into your LED circuit. For this, you need to break the connection between the annunciator’s LED and its power source. You can break it at any convenient point — either the top or bottom of the LED. Insert the 4N25 input to heal the break. In this way, the current that flows through the annunciator LED now flows through the 4N25 LED and turns on the transistor, which triggers the one-shot timer.